"The program requires the participants to learn at the institute for one week in a month and gain hands on experience for the remaining three weeks in their businesses. What is learned in the institute is to be applied practically in the business before commencement of further learning in the consequent month. . In the process, the participant gains expertise in the academic aspects of management education as well as the practical side of the family business." Generally family businesses are small to medium enterprises. Therefore learning has to be centered on this reality. The conventional MBA model trains students on working for MNCs, whilst this course would teach students how one can make his business into a MNC! In family business, the owner is responsible for the consequences of all his decisions made in the business. Thus he has to be trained in a manner where he has to assess the problem and outcome of the decision. One wrong decision could mean a loss resulting in extra time, money and effort spent to recover from it. With risks and stakes high, participants from family business require a different attitude to taking decisions, unlike training provided in MBA where one must make decisions on behalf of large MNCs where stakes in decision making are limited. Family managed business requires acumen and skills in running the complete business, ranging from issues relating to people to issues of finance. Thus training is provided to participants in all aspects of management. Unlike in a MBA program, where participants are trained to specialize in a particular field rather than General Management, which is a key component and skill in a family business. Every business is different and unique in its own way. Therefore it is essential to focus on those areas which one does not encounter except when running a family business. This can range from employing a person of higher competency level, professionalizing the organization, managing participation from members of different generations, addressing the role of the women of the family in the business, planning succession, etc. 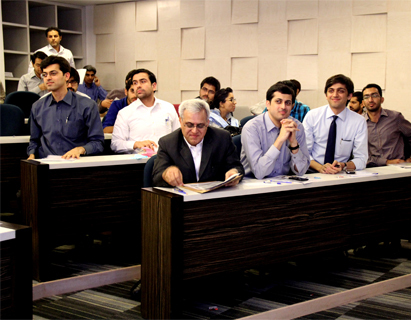 The conventional MBA program does not focus on these issues, unlike in this program where training is given on solving problems of such unique nature. Each participant is required to identify one mentor during the duration of the program who will guide the participant in matters relating to the organization. The mentor can be the father, the manager or any other person who knows the family business and is actively involved in its decision making. Because the participant is going to spend 3 weeks with the mentor, it is critical that the mentor spends quality time with the participant in trying to guide and help him during the duration of the course. The involvement of mentors is extremely crucial and will have a direct impact on the learning and benefits on the participants from the program.